It’s Jaunty January! 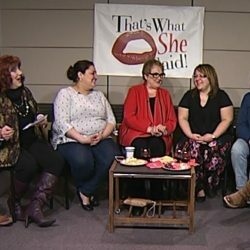 Join Jane Street, Sheila Harrington, Martha Richardson, Nicole Weaver, Joanne Lapic, and Corinne Davis as they chat about things old,k current, and future, and reminisce about bygone crap. Everyone imbibes and noshes! Who’d miss that? That’s What She Said!